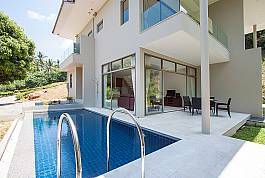 Gorgeous complex with tropical garden, communal pool and jacuzzi offering an impressive 2 bedroom penthouse apartment with kingsize beds in Chaweng Noi. 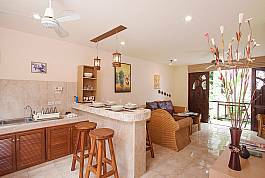 A sizeable open plan living and kitchen area, two balconies with pool view and a close by beach that you can reach within walking distance from the property. 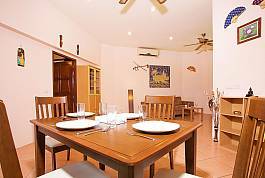 This 2 bedroom villa is the perfect place for you to holiday with your family and have your friends close by in the accompanying villa’s. 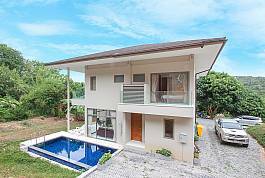 With one of Samui’s white sandy beaches just walking distance from the Villa and popular tourist areas just a short drive, there are plenty of places where you can shop, dine and explore in this great location. 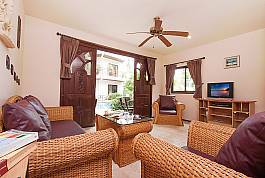 The holiday retreat is set on a small private complex where you have the choice to relax in and around the pool, Jacuzzi and secluded garden, or head into the close-by busy tourist areas. 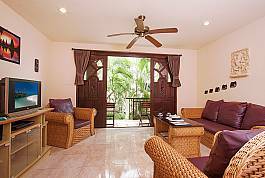 The 2 bed townhouse villa is next to other 2- and 1-bedroom units, so you could rent multiple ones depending on the size of your group. 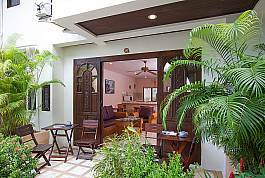 Triumph Villa B combines modern design and facilities with a serene tropical backdrop, creating a pleasant retreat for a family or two couples. 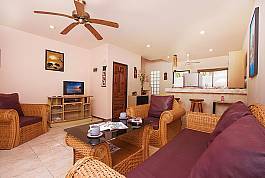 The semi-detached villa comes with a private swimming pool, bedrooms have sleek en suite bathrooms, and the nearest beach is only 1.5 km away. 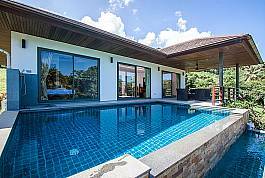 Experience true island paradise at Villa Gaw Sawan in the countryside of Bang Po, where you are greeted with a beautiful, spacious interior as well as the luxury of a private pool. 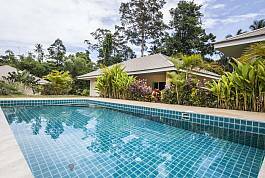 Take a short drive from the main Soi in Mae Nam and discover this beautiful 2-bedroom villa for 4 persons, hidden in the countryside with scenic gardens and a shared pool.